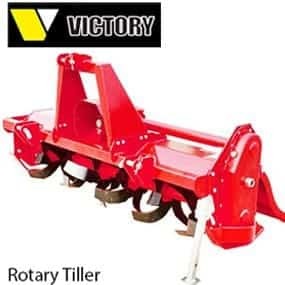 – Victory’s HR Tillers are the ideal machines for any kind of soil on your property requiring only 20-45 Tractor HP for maximum performance. – Your Standard CAT I.3point hitch connects the tiller to your tractor (adjustable lower hitch) with our PTO shaft (with slip clutch) transferring the tractor’s 540RPM by driven gear to 270RPM of Rotor Shaft Speed. Because the tiller turns in the same direction as your forward moving tractor, you need less horse power. 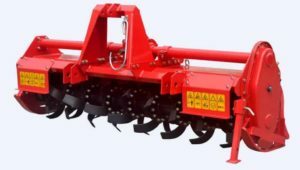 – The working width offered are 46” and 56”, and the 4 way adjustable working depth is up to 6” (depending on soil condition). – Victory uses a heavy (maintenance free) oil bath gear transmission. – The laser balanced blade shaft runs smoothly through even heavy and hard soil. – Underneath the 4mm steel housing sits the blade shaft with flanges in 10” spacing, each flange containing 6 L-shaped blades. – Depending on working width we use 30 (46″) and 36 (56″) specialty hardened blades, each weighing 610 grams. The blades can be individually exchanged and re-sharpened. – The free wheel transmission allows the blade shaft to turn, once the PTO is switched off, so it’s movement will not be transferred to the Tractor. 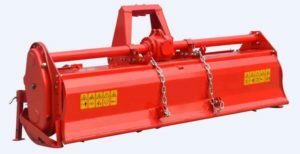 – The PTO shaft supplied with the tiller has a friction clutch (slip) for perfect protection. – The height adjustable rear Flap is providing a smooth finish and also protects against flying rocks for added safety. The completely assembled machine is delivered in a wooden casing. Just the PTO shaft protector needs to be assembled together with the PTO shaft and connected to the CAT I.3point hitch. Working Depth: up to 6″depending on soil condition.